At the National Care Planning Council, we are experts on veterans benefits. We can teach you how to use veterans benefits to find potential candidates for your products and services. We have been doing this for over 8 years. We also provide continuing education for accredited individuals. Additionally, we provide study materials for taking VA’s exam to become accredited and we provide a veterans claims application service for a number of our members. We have done thousands of veterans claims applications over the years – most of them successful. In addition, we sell a very popular book to the public to teach individuals how to make application for veterans benefits on their own. Veterans benefits are a substantial part of our business. Our planning approach targets all members of the senior market whether they are veterans or not. However, we realize that at least 33% of all seniors are veterans or surviving spouses of veterans. In order for you to focus in on these particular individuals, we have also designed our life resource questionnaires and our retirement planning questionnaire to uncover if your clients are veterans or surviving spouses and to possibly identify whether they might qualify for benefits or not. 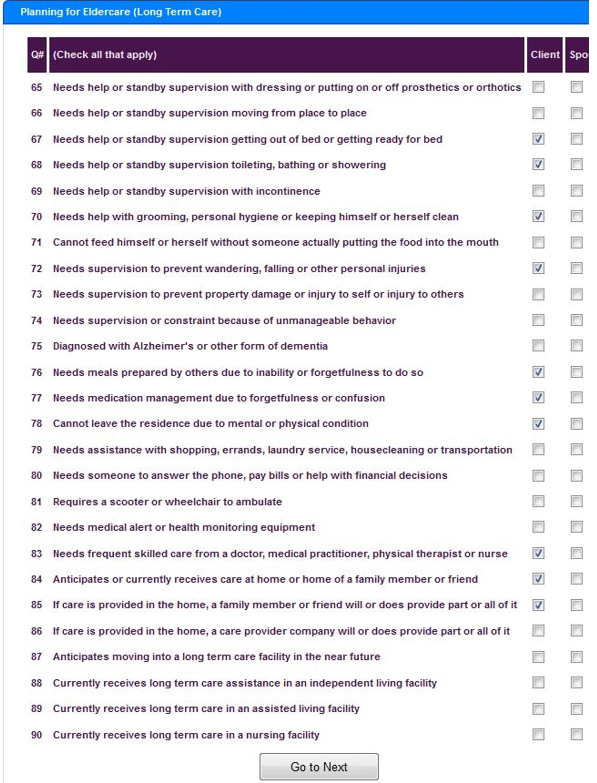 We include screenshots of portions of one of our 3 questionnaires below to show you the sections that can help you identify veterans or survivors. 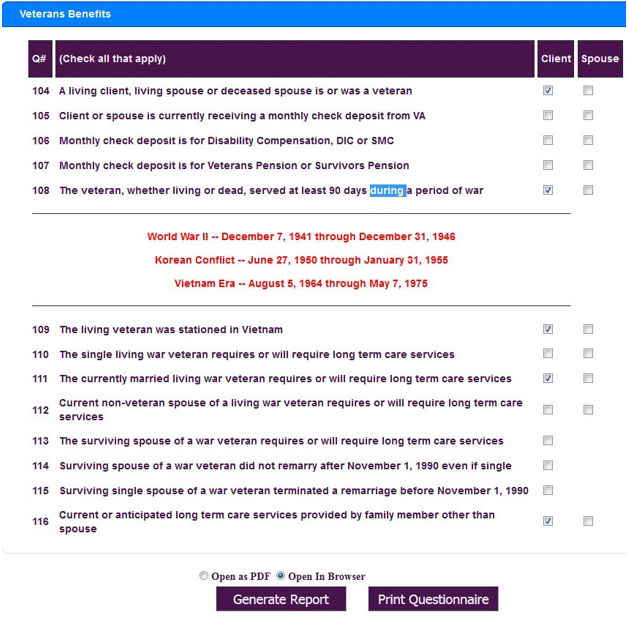 All 3 of our questionnaires include sections for identifying veterans. The first screenshot below is not only used to determine the long term care needs of your potential clients, but it will also help to identify eligibility for the so-called "Aid and Attendance Benefit." The second screenshot below is specifically designed to uncover veterans or surviving spouses and possibly identify which benefits they might qualify for. Both questionnaires – the Life Resource Survey Questionnaire and the Retirement Planning Questionnaire have this section that can determine if your potential client is a veteran or the surviving spouse of a veteran. You must be accredited by the Department of Veterans Affairs in order to assist veterans or surviving spouses to receive their benefits. We include a discussion of accreditation further on in this article. In article #18 we discuss how you can help veterans obtain their benefits without your being accredited and how you can make a planning fee by doing that. According to the Department of Veterans Affairs census estimates, there are approximately 13 million veterans and their single surviving spouses age 65 and older. Comparing this to a total of 41 million Americans 65 and older, veterans and their single surviving spouses represent a good portion of the senior population. This slice of the senior population is a huge and largely untapped source for finding new sources of income to pay for care. According to VA about 42% of all veterans are 65 and older. This percentage will continue to grow as the bulk of the Vietnam veterans – the largest cohort – are still younger than age 65. Senior veterans are typically in receipt of four cash income programs from VA. Two of these programs – pension and death pension – are paid to veterans and their surviving spouses who are non-service-connected disabled. The other two of these programs – compensation and DIC – are paid to veterans and their surviving spouses due to disability or death from service connection. We will discuss these programs in a little more detail in a section below, but for now let's look at some statistics. The table below represents the number of beneficiaries of these four benefit types of income that VA intends on paying in 2014. We had to interpolate the information to determine the numbers in the two age brackets in the table. This was based on how many cases are expected in different "periods of war" age groups. The numbers in each age bracket may not be totally accurate but they represent a good guess. From the table, VA estimates handling about 4,727,500 cases in 2014, and of those about 37% or 1,757,800 beneficiaries are age 65 and older. It is important to note that of those 1.8 million beneficiaries 65 and older, only about 28% or 516,900 beneficiaries will be receiving Pension or Death Pension. Also note that the number of surviving spouses receiving DIC is about 25% more than those receiving Death Pension. Why are these observations important? Because those practitioners who focus on educating seniors about veterans benefits almost always direct their attention exclusively to Pension or Death Pension – only about 28% of all VA beneficiaries. In contrast, seniors receiving service-connected payments represent 72% of those beneficiaries age 65 and over. Those seniors who could benefit from knowing more about Compensation and DIC and the aid and attendance assistance available from those benefits are often completely ignored. Commonly called "aid and attendance," these twin benefits provide cash payments to veterans who served during a period of war or to their single surviving spouses. Pension helps to cover the cost of home care, assisted living and nursing home services. Cash income payments from pension range from about $700 a month to a little over $2,000 a month depending on the type of claim and the medical rating involved. Most people don't even know of the existence of this benefit. VA does not advertise it and as such many eligible people never apply. It is unfortunate that pension has been misnamed "aid and attendance." "Aid and attendance" and "housebound" are actually additional monetary allowances provided with pension if the recipient of pension monies needs the regular aid and attendance of another person or is considered housebound. The misnomer creates confusion because an aid and attendance assistance allowance is also available for service-connected disabilities (disability compensation) and to a spouse of a service connected disabled veteran and also an aid and attendance allowance is available to a surviving spouse of a veteran if the surviving spouse is receiving DIC (dependents indemnity compensation. Approximately 309,200 senior veterans will receive Pension in 2014 and 169,700 of senior veteran survivors will receive Death Pension in 2014. Disability Compensation is a tax-free benefit paid to a veteran for a service-connected disability that happened as a result of active duty, active duty for training, inactive duty training or injury from VA healthcare. Cash income payments for Compensation range from a low of about $130 a month to a high of about $8,400 a month. Special benefits like grants for new automobiles or modifying existing automobiles, grants for constructing or modifying homes, clothing allowances and so on are payable for severe service-connected disabilities. A veteran cannot receive Pension and Compensation at the same time and a surviving spouse cannot receive Death Pension and DIC at the same time. A choice must be made which benefit the beneficiary wants to receive. This aid and attendance allowance is not an automatic benefit and most veterans don't even know about this special assistance and never apply for it. If the veteran receiving Compensation is not 100% disabled, the need for aid and attendance might possibly allow for that increase in rating and the additional assistance for aid and attendance on top of that. Most veterans receiving Compensation don't have a clue as to their eligibility for this special benefit. Also, an aid and attendance assistance allowance is available due to the need for services to a disabled spouse of a veteran where the veteran is 30% or more disabled. The amount goes up as the disability rating goes up. For example, a 30% disabled veteran can generate a $44 a month benefit as a result of his or her disabled spouse. A 100% disabled veteran can generate $149 a month. Again, it is not common knowledge these additional allowances are available and VA does not normally notify people of their existence. Of particular note for Disability Compensation are Agent Orange claims for each and every veteran who was stationed in Vietnam and who has developed presumptive health conditions such as certain forms of cancer, type II diabetes, ischemic heart disease (lack of proper blood flow to the heart) and Parkinson's disease. Veterans with service-connected hearing loss can also make claims and receive free hearing aids. This hearing disability rating will also get them into the health care system. Many veterans don't know of the existence of Agent Orange claims or the fact that they might be eligible for service-connected disability for hearing loss. Approximately 3,846,000 beneficiaries will receive Compensation in 2014 and of those approximately 1,065,800 are age 65 and older. Of all beneficiaries, approximately 340,000 are 100% disabled. The VA health care system is the largest single provider of health care in the United States. It has also been recognized by numerous surveys as being one of the best providers of health care as well. Not all veterans can receive care in the system. Eligibility requires either service-connected disability, receipt of pension, special service recognition or low income and less than $80,000 in assets. For the aforementioned beneficiaries, all services are free and medications are $8.00 per month per medication regardless of what it is. There are no other out-of-pocket costs such as health care premiums. Help can also be provided with disability-required home renovation grants of $2,000 or $6,800, orthotics, prosthetics and in certain cases hearing aids. VA outpatient clinics are available in most communities. Approximately 8,400,000 individuals are enrolled in the health care system. Dependents Indemnity Compensation (DIC) – also called Dependency and Indemnity Compensation – is payable to eligible survivors of a military service member who died on active duty or whose death after service resulted from a service-connected injury or disease. It is also available due to improper treatment of the deceased veteran from VA healthcare or rehabilitation services. DIC is automatically granted to a surviving spouse for a veteran who was permanently and totally disabled for 10 years or more. DIC pays $1,254 a month in 2016 to a surviving spouse. Additional amounts are available if there are dependent children. A dependent child is one who is 18 years old or younger or 23 years old or younger and enrolled full-time in school or is an adult who became totally dependent prior to the age of 18. If the surviving spouse needs the aid and attendance of another person such as home care, assisted living or nursing home care, an additional $311 a month assistance benefit will be paid. This DIC with aid and attendance benefit is about $400 more a month than a surviving spouse can receive from Death Pension. This additional benefit is not automatic and most individuals receiving DIC do not even know it is available. An additional monthly benefit for being housebound is also available. Approximately 364,600 spouse survivors will receive DIC in 2014 and of those approximately 213,100 are age 65 and older. The majority of these are surviving spouses of veterans from the Vietnam era. Money is available for burial costs for veterans who were service disabled, receiving Pension or died under VA care. If the death was a result of service-connected disability, $2,000 is available. If the death was non-service related, and the veteran was receiving Pension or Compensation or was entitled to either of these, up to $700 is available for a plot allowance and an additional $300 is available for burial and funeral expenses. All veterans also receive free burial in State and Federal VA cemeteries. Under certain conditions, spouses and other family members can receive free burial in State and Federal VA cemeteries. All veterans are eligible for a grave marker (or equivalent monetary allowance), a flag for the coffin, a graveside honor guard and a letter from the President of the United States. Approximately 60,000 veterans will receive the burial allowance in 2013 and 33,000 will receive a burial plot. VA expects about 18,000 service-connected deaths in 2013 and claims for about 350,000 grave markers. About 500,000 flags will be given for burial. All states offer various additional benefits to veterans to include special recognition, property tax reduction, free hunting and fishing and state parks admission as well as a whole host of other benefits. Some states are more generous than others and in some states veterans can receive a one-time cash stipend. A letter or written statement does not prove authorization for accreditation. The Office of General Counsel maintains an updated list of accredited individuals on its website. This list is the official accreditation authority. You can find this list by going to www.accreditlist.com.